What a lovely Christmas moment. 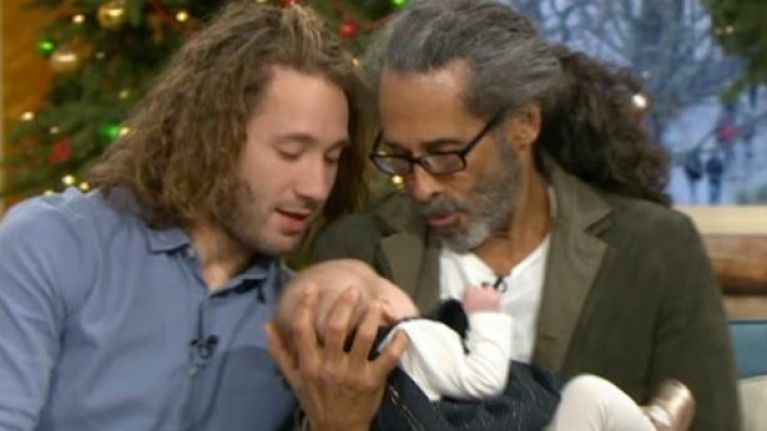 This Morning fans were left in floods of tears today [December 21] as a man met his son for the first time - then met his baby granddaughter. Ollie Aris explained that he had been raised by his mum, never knowing his father. However, he found his dad - Les Senzon - on Facebook seven years ago. The pair lost contact after Les was involved in an accident, but managed to reconnect again recently. They were brought together at the ITV studios today and it was just all so emotional. "Growing up I knew very little. But I used to look at other families and think I really wanted that. It was hard." He connected with his dad via Facebook when he was 21, but their communication fizzled out due to a number of family factors on Les' side, as well as the screenwriter experiencing a serious injury. After the pair reconnected, Ollie invited Les to come to the UK for Christmas - and to meet his granddaughter, Blake, for the first time. "Hi sweetie," Les beamed down at the little girl as he held her in his arms. The heartwarming moment left viewers in plenty of tears, with many sending their best wishes to Ollie and Les.